In the remainder of this report we will first describe the findings of these four core studies followed by how these combined data will be used be resources managers (Section A). Then we will describe the procedures and resources developed as part of work that have immediate impacts beyond our study area (Section B). For this study three geographically separated, discrete groups of O. lurida within Puget Sound were selected. These animals were brought to a hatchery, spawned, and the offspring from each population outplanted back to the bays selected. This approach enables observations about how differing natural environments with resident oyster populations may affect both local and non local populations over time. Three bays (ie. 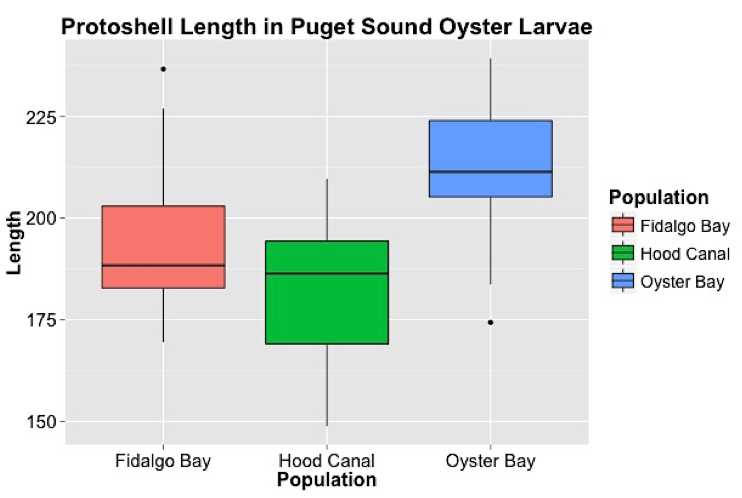 Fidalgo Bay, Dabob Bay, and Oyster Bay) within Puget Sound were selected for this experiment based on presence of resident O. lurida populations, distance from other bays, and latitudinal position. Fidalgo Bay is the most northern site and experiences cooler year round conditions. This bay is also more directly influenced by the Strait of Juan de Fuca, allowing colder sea water directly from the Pacific to mix with bay waters. Dabob Bay is located within Hood Canal, an area of Puget Sound distinctly separated from the rest of the sound. Oyster Bay is the southern most site and known for its historically large numbers of O. lurida. Oyster Bay demonstrated greater reproductive activity at all sites with moderate growth and survival (Figure 1). Together these data suggest the existence of oyster population structure within Puget Sound and provide information on how broodstock should be selected for restoration purposes. Figure 1. 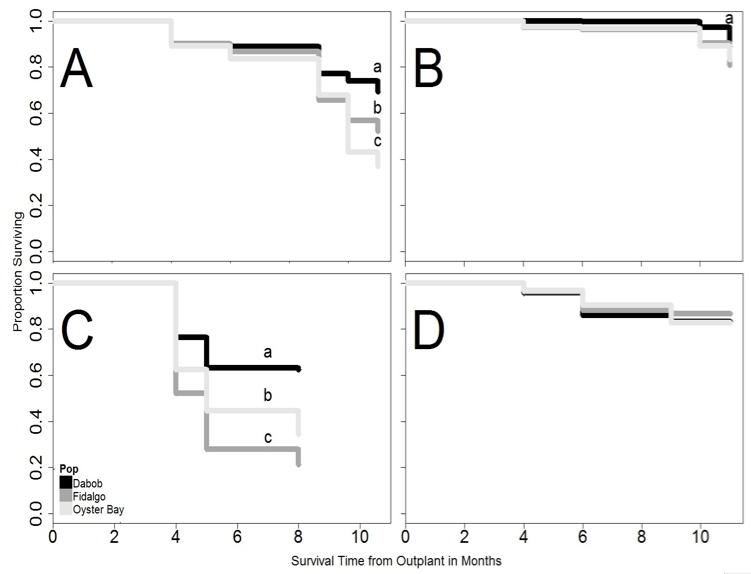 Proportion survival for three oyster populations at four locations; Southern site (A), Central site (B), Hood Canal site (C), and Northern site (D). Lowercase letters (a, b, c) are significant differences. Figure 2. Percent Brooding Females from Each Population at Each Sample Date at Oyster Bay (top), Fidalgo (middle), and Manchester (bottom). Percent determined by number of brooding females (Br) divided by number of open oysters (T) or %=(Br/T)*100. Differences in life history traits among oyster populations grown in different locations within Puget Sound, WA suggest adaptations possibly linked with environmental cues. 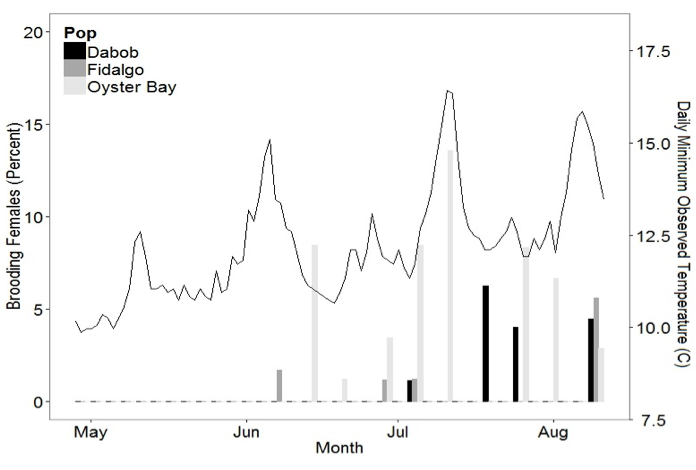 High survival, low growth, and low reproductive activity of the Dabob Bay population is likely due to extreme environmental variation at their home site leading to improved stress resilience. The greater proportion of brooding females in the Oyster Bay population and reduced environmental energy needed to induce peak spawning may be related to positive selection pressure for early spawners due to warmer temperature trends at their home site. Findings from this study indicate possible local adaptation in two of the three populations observed but there may be other factors dictating observed phenotypes, including the fact that we do not know broodstock used here were from local parents. Based on the results of the transplant experiment and apparent differences in stress responses, we examined expression of genes associated with growth, immune function, and gene regulatory activity in oysters from the three populations following temperature and mechanical stress. We found that heat stress and mechanical stress significantly changed expression in molecular regulatory activity and immune response, respectively. We also found that oysters from Oyster Bay had the most dramatic response to stress at the gene expression level. More specifically oysters from each population were brought to the lab and subjected to acute temperature stress (38°C water for 1 hour; n=14 per population), mechanical stress (1000 rpm x 5 min; n=14) or served as controls (maintained at 8°C; n=14). Oysters were placed back in 8°C seawater and sampled at 1 hour post stress (n=8). Six oysters were also monitored daily for 14 days to assess survival. Ctenidia and mantle tissue was dissected and stored in RNAzol RT (Molecular Research Center, Inc.) at -80°C for later analysis. 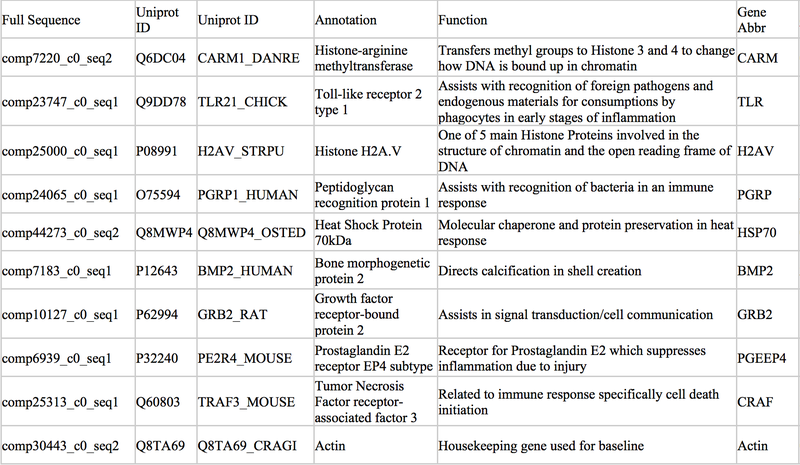 Quantitative PCR was carried out on the nine genes listed in table 1. Contrary to our hypothesis, oysters from Oyster Bay demonstrated the greatest difference in response to stress compared to the other populations. Specifically oyster originally from Oyster Bay, had an increase in H2AV expression during heat stress as compared to control, a decrease in BMP2 and GRB2 upon mechanical stress, and differences in HSP70 expression between the two treatments. While only speculation at this point, the gene expression pattern differences observed here with oysters from Oyster Bay coupled with corresponding field-based observation that this population has the greatest reproductive activity, could indicate this population has a greater ability to effectively respond to energy demands. This trait could certainly be perceived as advantageous for restoration purposes. On the other hand, the results of the gene expression analysis does suggest population differences. Caution should be used in using non-local stocks when structure exists, as it is possible to have supplemented oysters outcompete the native population or to create hybrids that are ultimately less fit than the native counter parts. 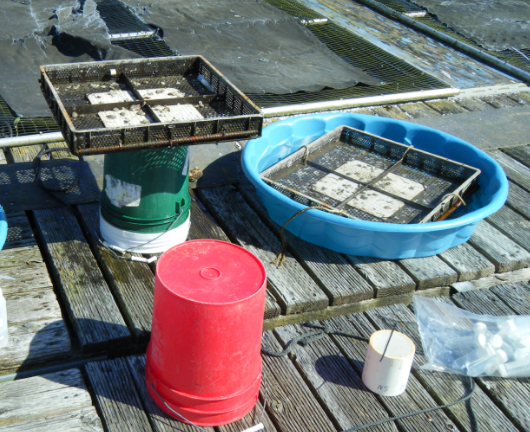 To test if differences in fitness observed in the reciprocal transplant experiment were consistent in F2s raised in controlled, common conditions, we conducted a common garden study in Summer 2015 with ~100 F1 oysters from each population at the K. K. Chew Center for Shellfish Restoration and Research in Manchester, WA. Concerns over transgenerational effects would be mitigated if F2 animals reared in the same environment showed similar interpopulation differences as the F1s. Oysters from each population were spawned in 5 groups of 20 oysters to promote genetic diversity. Newly released larvae were combined based on population and reared in 100 L tanks. After reaching >160 μm in size (as determined by filtering over mesh screens), larvae were moved into a second tank and raised until close to metamorphosis (> 224 μm). Juveniles reaching metamorphosis at the same time were established on 10 cm x 10 cm PVC tiles before being placed in nearby Clam Bay to grow for 10 weeks. Reproductive output and growth rate were used as fitness proxies. Reproductive output was estimated by counting the number of spawned larvae from each group (Figure 3). Similar to the reciprocal transplant experiment, oysters from Oyster Bay showed the earliest and greatest reproductive output. To measure larval growth rate, ~700 one-day old larvae were raised in 1 L beakers for 2 weeks with daily water changes, with 6 replicates per population. Samples of 100 larvae were taken 3 times throughout this period and measured using a microscope and ImageJ. 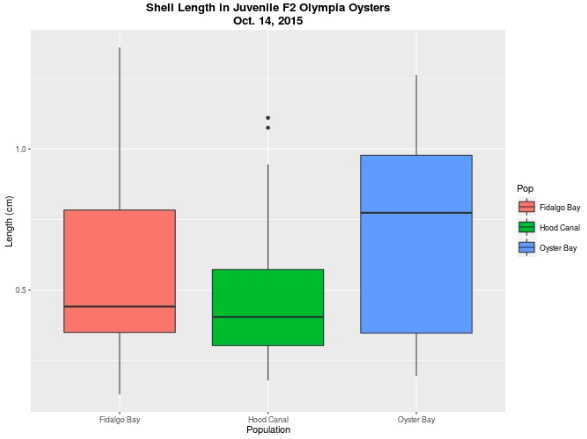 In analysis of protoshell length in 20 seven-day-old larvae from each population, size varied significantly among populations and the larvae from Oyster Bay were significantly larger than those from Oyster Bay (Figure 4). After establishing on the PVC tiles, juveniles were measured at three time points over 10 weeks, from August 2015 to November 2015. 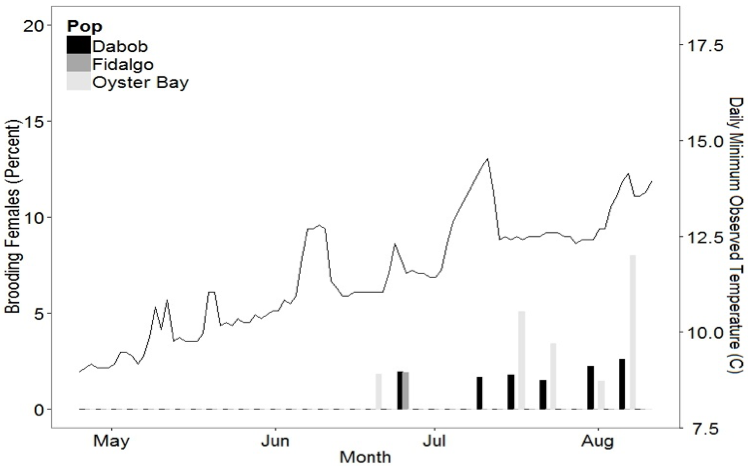 A measurement of approximately 30 juvenile oysters from each population in October was consistent with the larvae measurements and reciprocal transplant results in that oysters from South Sound were significantly larger than those from Hood Canal (Figure 5). These results are concordant with the reciprocal transplant indicating that phenotypic differences in size may indeed be due to genetic factors and not environmental effects. Figure 3. Reproductive output as measured by number of larvae released. Figure 4. Protoshell length in 27 day old larvae. Figure 5. Size measurements of oysters on tiles. In conjunction with examining growth and survival of F2s in order to determine if population difference were independent of environmental factors, we also characterized genetic and epigenetic differences in our target populations. To examine genetic differentiation of the three populations we characterized single nucleotide polymorphisms (SNPs). Using a 2bRAD reduced-representation sequencing approach, we sequenced 279 individuals with roughly equal representation of all three populations. To date we have identified 3,510 SNPs confidently genotyped in at least 50% of samples examined. To get an estimate of population differentiation among our three populations, we thinned our dataset and selected 882 SNPs genotyped in at least 70% of 59 individuals. Using Weir and Cockerham's 1984 FST estimator for each SNP, we found a mean FST of 0.0528 for all 59 individuals as three subpopulations. Eight SNPs had elevated values of FST over 0.4. Average pairwise FST was highest between the Oyster Bay and Hood Canal populations (0.0668), with 24 SNPs having an FST over 0.4. Pairwise FSTs in comparing Fidalgo to Hood Canal and Oyster Bay to Fidalgo were 0.0433 and 0.0485, respectively. Together these results indicate there is population differences, though some gene flow could exist. There are also specific loci that are segregating more among populations and could be associated with population specific traits. For the first time in this species, we also characterized the potential epigenetic component of population differences. To confirm that the epigenetic signature of DNA methylation persists independent of environment, we characterized whole genome DNA methylation via bisulfite sequencing of Oyster Bay and Hood Canal oysters both grown out in Clam Bay. Nine individuals were sequenced and there is a clear population specific signature that likely contributes to phenotypic differences in populations (Figure 6 & 7). Figure 6. 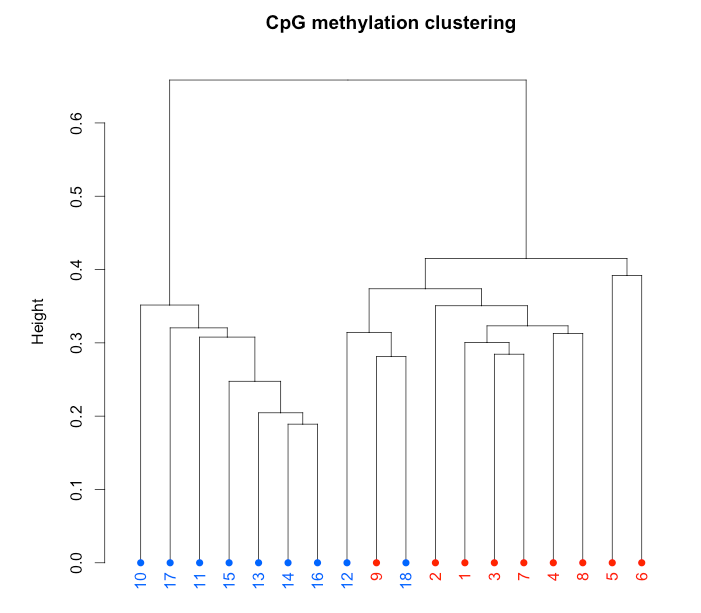 CpG methylation clustering cladogram of oysters from Oyster Bay (blue) and Hood Canal (red) grown in Clam Bay. Figure 7. 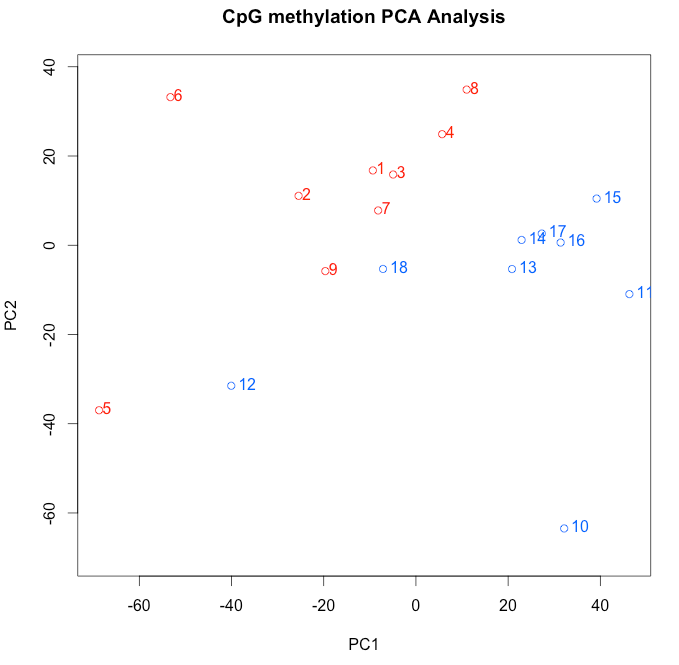 CpG methylation PCA analysis of oysters from Oyster Bay (blue) and Hood Canal (red) grown in Clam Bay. Our results certainly have important implications for restoration of Olympia oysters within Puget Sound, WA. There are a number of ways that these findings could be used in generating restoration strategies specific to Puget Sound and in the face of climate change. 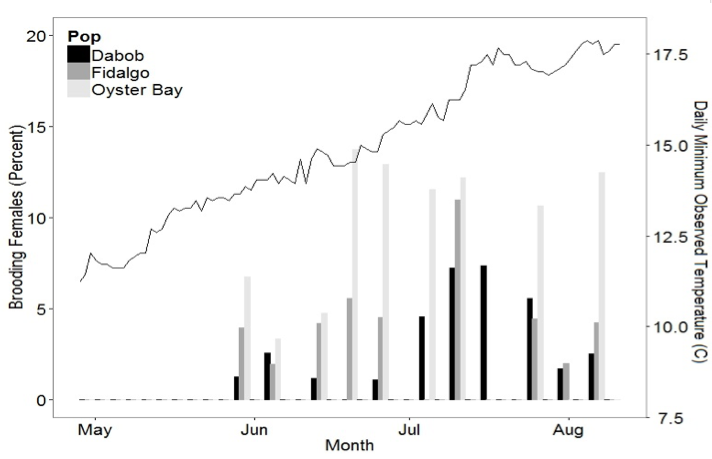 Based on the fact that Dabob Bay oysters had the lowest mortality, use of the most robust population for broodstock may increase chances for outplant survival. Generally, this approach would dictate organisms should be used from home environments that experience persistent stressful conditions. An alternative approach managers might take given the current findings is to take the population with the greatest reproductive output (Oyster Bay) and use it as a source of broodstock. This would increase the likelihood of juvenile recruitment and ultimate restoration of the species, while also producing more offspring for outplant. Having a strong understanding of population related phenotypes creates another option for restoration efforts. An assisted gene flow strategy that incorporates the outplanting of populations known to contain phenotypes fit for the new environmental parameter and have them interbreed with resident populations. It is highly debated whether such a strategy would have benefits that outweigh the drawbacks, such as possible outbreeding depression, but should be considered for restoration efforts facing a variety of climate change scenarios. Ultimately, what these studies demonstrate is that population structure can and does exist on a relatively small geographic scale and thus moving oyster populations to locations where remnant stocks exist could be disadvantageous. When population structure exists, there should be caution with respect to moving populations as: 1) transplanted populations could overwhelm locally adapted remnant resident populations, and possibly not persist themselves, 2) transplanted populations might not survive in new location and thus wasting resources required for restoration, and 3) transplanted populations could interbreed with remnant population and thus result in overall reduced fitness through outbreeding depression. In addition to the array of data we produced concerning differences in populations of oysters in Puget Sound, we also developed procedures and resources that will contribute to aquaculture practices and fundamental biological investigations. One key metric to understand adaptive divergence in Olympia oysters is reproduction, a fitness component. Reproductive timing and effort differences among populations reared in a common environment can indicate local adaptation. Targeting these metrics heretofore required sacrificing many Olympia oysters to find a subset of active brooders. We developed a simple, nonlethal field procedure to anesthetize Olympia oysters, causing them to gape sufficiently to ascertain brooding status, enable collection of broods, and/or facilitate tissue sampling. Briefly, the method involves 45 min exposure to air, followed by immersion in 83 mM MgSO4 for 45 min. After testing the method in the lab, the method was used in our field study on a weekly basis to obtain reproductive timing and population proportion data. Repeated exposure of Olympia oysters to the anesthetic resulted in no detectable mortality or adverse effects. The anesthesia method has been used in at least 3 other Olympia oyster research projects (B. Becker, UW Tacoma, personal communication; J. Barber, Swinomish Tribe, personal communication; D. Zacherl, CSU Fullerton, personal communication). The method and field application are currently being prepared for submission for publication. Figure 8. Photograph of oysters subjected to anesthesia procedure prior to sampling. Olympia oyster restoration in Puget Sound can in some cases be best realized using hatchery produced seed. It is important, however, to minimize genetic differences between hatchery seed and the wild population targeted for supplementation. A breeding plan was set up to try to ensure low differentiation between seed oysters derived from wild South Puget Sound broodstock, and a random sample of the population in South Puget Sound. The breeding plan involved creating a series of small breeding groups of wild adults, thus ensuring genetic diversity in the population of larvae released over a period of about 2 months. To further optimize genetic diversity, the larvae/juveniles from the breeding groups were reared separately until outplanting to enable even contribution from each breeding group. We used 7 microsatellite loci to compare diversity metrics between a random wild sample and the seed destined for restoration. We also compared commercial hatchery production (Taylor Shellfish) to the wild sample, expecting to see lower diversity. We detected no significant differentiation between the south sound wild Olympia oysters and the Taylor hatchery produced seed. In contrast, we detected low level differences between the restoration seed and the wild adults. The same pattern was evident for the restoration seed produced in the following year. Based on these results, the currently adopted method for restoration seed production mimics the commercial production method used by Taylor Shellfish. Approximately 1200 broodstock are held in a common tank and all released larvae are collected. The primary difference between the commercial and restoration method is the period of collection: for the former, collection is terminated once sufficient larvae are released for production goals, while for the latter, the restoration hatchery collects released larvae over an extended period (ca 2 mo) to capture and retain genetic variation in spawn timing which is likely of adaptive significance. As part of this project and complementary efforts we have been able to generate a wealth of genomic data including RNA-Seq, RAD-Seq, Bisulfite Sequencing, and Whole Genome Shotgun data. One transcriptome has been published (Timmins-Schiffman EB, Friedman CS, Metzger DC, White SJ and Roberts SB. (2013) Genomic resource development for shellfish of conservation concern Molecular Ecology Resources. 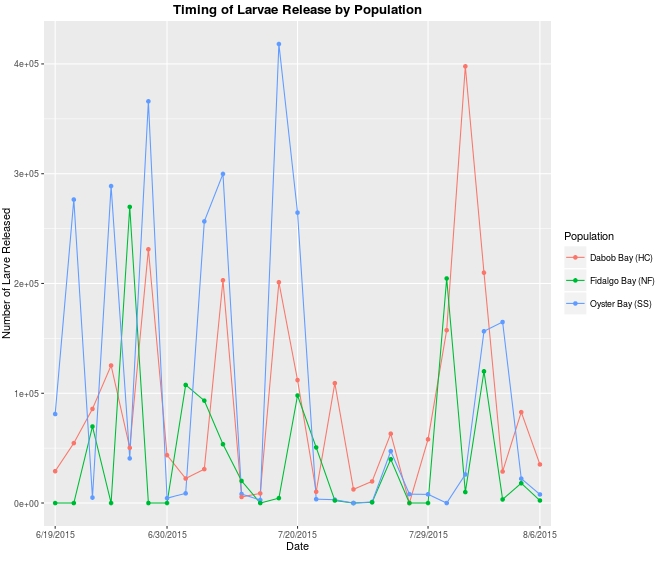 doi:10.1111/1755-0998.12052) with all data publicly available at http://owl.fish.washington.edu/nightingales/O_lurida/. We have also developed a webpage to make these data more easily accessible (http://oystergen.es/olympia/). In addition we have created a genome browser where anyone can visualize these data or combine with other data (Figure 9). While much of these data provided core information for us to be able to characterize local population of Olympia oysters, we suspect these data will provide important resources for others involved in aquaculture, biological, and environmental studies. Figure 9. Screenshot of Olympia oyster genome browser available at https://genomevolution.org/coge.